Emoticoins slot comes with great sounds, vibrant graphics and everything to thrill the player that looks forward to an exciting gameplay. 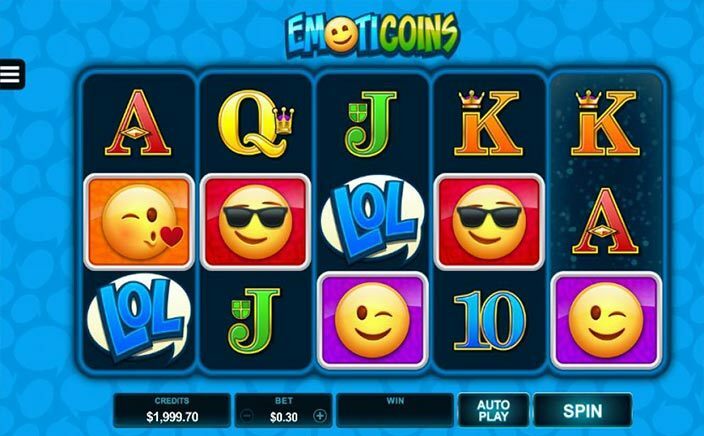 There is a collection of cheerful Emoticoins like; a kiss, winking face, unhappy mood, and tears of laughter in this 5-reel slot. Also, there are 30 fixed paylines and a setup of the standard 5×3 grid in this mobile-compatible slot game. The slot brings some popular emojis you see in text screens daily. Before you spin the reels; place a bet range from at least £0.30 to £300.00, and expect to win coin Jackpot, free spins, and other games bonuses. During the base game, the Wild Blast feature gives the player five extra wilds randomly for the next spin. On the reels are the five smiling emojis, and regular playing cards. With a return-to-player rate of 96.5%; the medium variance slot game potentially multiplies your stake on every spin by 306 times and makes you richer by 92,000 coins (maximum) with a single spin. The Emoticoins logo is the game’s wild symbol that replaces other less-essential symbols on the reels, except the other Wild symbol and the Scatter. The LOL smiley icon is the game’s Scatter symbol. To trigger the ten free spins; simultaneously land at least three LOL Scatters symbols. The Scatter multiplies your total bet and increases the win on your Paylines. During your first free spin; a Scatter symbol changes into a Wild. These Wild Stickers linger on screen until the player exhausts free spins feature. More so, the Wild Stickers becomes wild, and changes on the 3rd, 5th, 7th and 9th free spins. They attract an extra symbol (sticky wild) and multiplies your stake by 300 times. With the display of colourful emojis, it’s difficult to dislike this slot game where the random three bonus features depend on wilds. 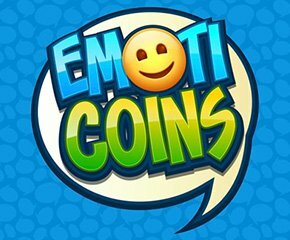 The fun game of Emoticoins is easy to learn, as it uses colourful emojis (similar to social media’s) in fixing your wins. The main game’s features are; Free Spins, Sticky Wilds, Bonus Game, Scatter and Wild symbols. Human emotions have the capability to communicate in a completely different way without using alphabets or numerals. This slot does an impeccable job portraying it on the reels.